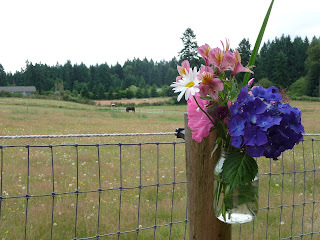 The Occasionist: Pacific Northwest Wedding Teaser: Here Come the Girls! Pacific Northwest Wedding Teaser: Here Come the Girls! I went to a splendid backyard/garden/farm wedding last weekend on an island off of Seattle (and no, I am not just saying that because it was my best friend's wedding: it actually was a design blogger's dream come true.) I'm still traveling the craggy cliffs and winding roads of that particular coast, so I'll just give you a first taste today. More to come!